Roxana Tohaneanu-Shields is a Romanian born artist who lives and works in the UK. Having graduated from Bucharest University in Philosophy in 1998 she took a further degree in Art and Philosophy at The University of Reading where she is currently researching for a PhD in Aesthetics. Roxana works in a variety of media but her principle interest is in film photography. 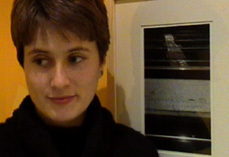 She has exhibited her work in a number of galleries and art museums including the Art Museum of Constanta, The art Museum of Brasov, Gallery4allarts at the Independent Liverpool Biennial 2008, the Other Gallery London and the Stroud House Gallery.